FESPA in 2019 returns to Munich, Germany and Folex proudly presents its wide media assortment for large format ink jet printers. The range continues to expand, offering customers high quality, consistent and reliable European produced materials, with coatings suitable for all the current ink jet printing technologies including latex, solvent, aqueous and UV inks. Printed electronics are applied for an increasing number of applications, due to their flexibility and the possibility to create transparent circuitry. Printing, a direct method, is also interesting from a cost perspective. Films play an important role in such processes as carriers or protective layers. As a specilist in the coating and converting of films and similar web-like substrates, the Folex Group offers R & D services, processing of aqueous, solvent-based and UV-reactive formulations, scratch-resistant coatings, thermo-stabilization, lamination & converting etc. All this also under cleanroom conditions. When you want to select a tough, tear and water resistant synthetic which will stand up to really demanding applications then look no further than our Longlife Pro Matt WO. It’s your ideal solution for creating durable manuals, outdoor signs, point of sale, point of purchase, charts, maps, signage, menu cards etc. In fact the possibilities are endless. With our latest, new generation version you can be assured that you will enjoy ultimate performance with all high speed printers, copiers and digital presses. The material is available in a variety of thicknesses from light to super heavy weight in 90, 115, 140, 190, 265 & 350 micron grades. Formats available are SRA3, A3 & A4. Find out more about our system solutions for the packaging industry. We are happy to welcome you at booth # 622 in hall 8.
application window graphics and rollup films with high glossy nanoporous finishes. the printing process can create an electrical charge which normally means its difficult to print. Folex is the substrate provider for printed applications! The company has been manufacturing for the print-on industry substrates for all types of printing technologies and ink-types for many years. These years of experience and continuous, innovative development have led to an extensive portfolio of films and speciality substrates. not possible. Today Folex provides a nice solution to this challenge with Signolit SC 48 and SC 50.
collateral is increasing as clients demand products and brands in the right place at the right time. Come & join Folex on stand 9C12 at Label Expo, Brussels to see the latest complete portfolio of face films and finished adhesive materials suitable for label printing, Folex looks forward to welcoming you to the booth. and due to the nano coating, absorbs the water based inks directly into the coating layer. In focus for 2017 in Hamburg, Germany was the introduction of all things shiny with the launch of two high gloss, nanoporous products offering stunning performance for photo quality, waterbased printers. These products left a great impression with visitors and the discerning, critical printer whose expectation is to present the best in image & print performance and create that additional WOW factor with their clients. comes home with "the fine art of coating"
Visit us on this year's DRUPA exhibtion, which will take place from May 31st to June 10th 2016. You will find us in hall 4, booth number 4F05. Find out more about our latest product developments in the printing, digital and electronics industry. 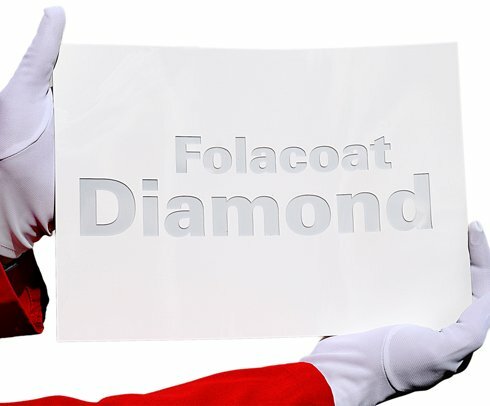 The Folacoat Diamond coating plate is a premium product from the Folex coating plate range and was developed specifically for the field of high-gloss UV coating. Please contact us to receive your samples. Visit us on this year's FESPA DIGITAL in Amsterdam, hall 1, booth number J51. At FESPA in Amsterdam, Folex presents its wide media assortment for large format ink jet printers. The range continues to grow, offering customers high quality, consistent European produced materials, with coatings suitable for all the current ink jet printing technologies. for HP Indigo graphics media. We are at INPRINT - INDUSTRIAL PRINT SHOW from November 10th - 12th, 2015 in Munich. Please visit us on stand number C33 in hall A6.